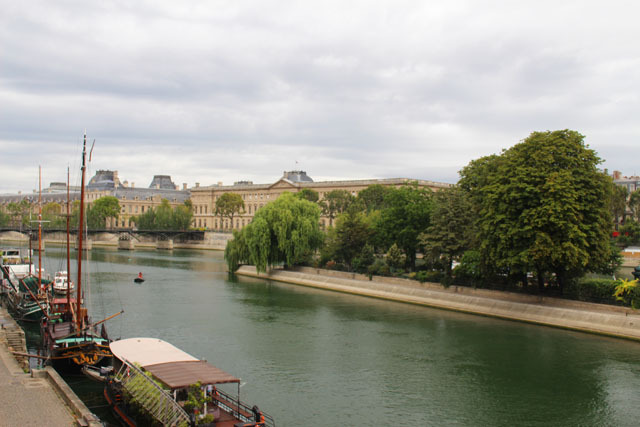 Our favorite thing to do in Paris is dining by the river, but we also spent some evenings in the other neighborhoods we like around Paris. 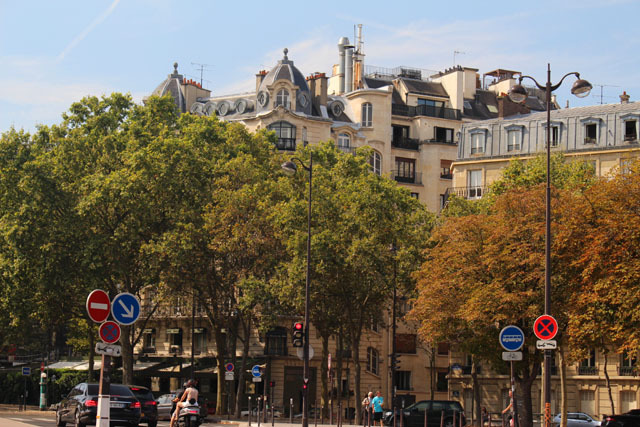 One of our favorite places is Montmartre, which is on a hill overlooking Paris. 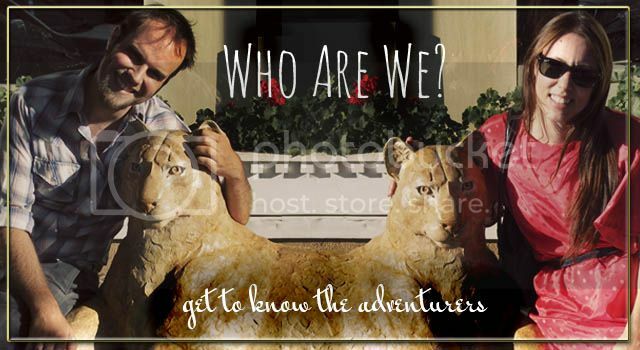 It's the stomping ground of Hemingway, Dali and the Fitzgeralds, so naturally it's a great place to be an artist. 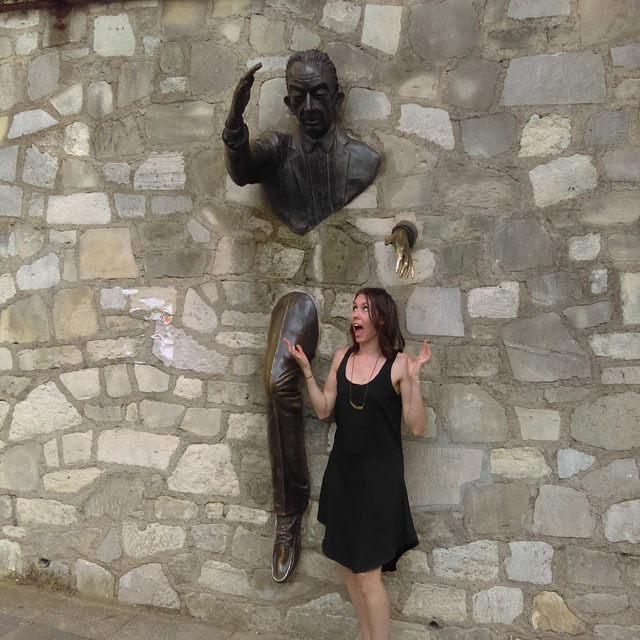 A funny statue right below our favorite Park in Montmartre to have a picnic. 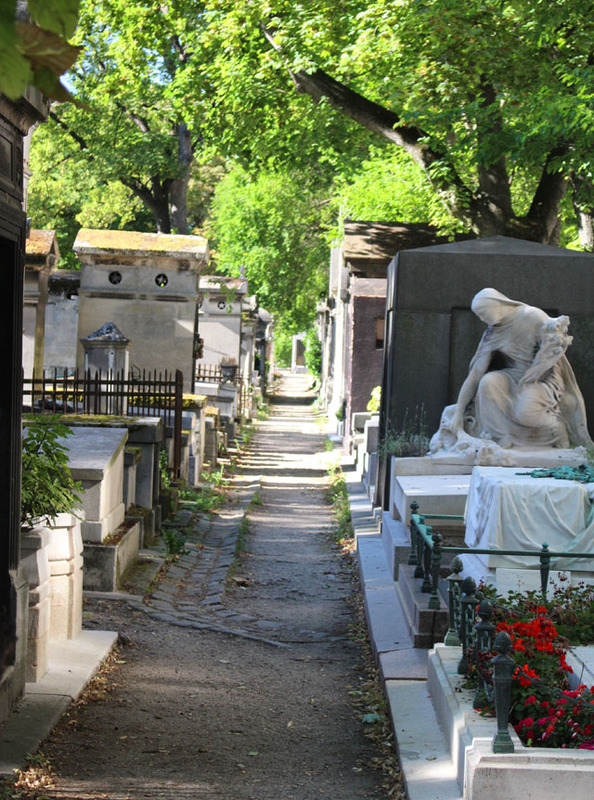 Montmartre has a great old cemetery that we visited a few times. 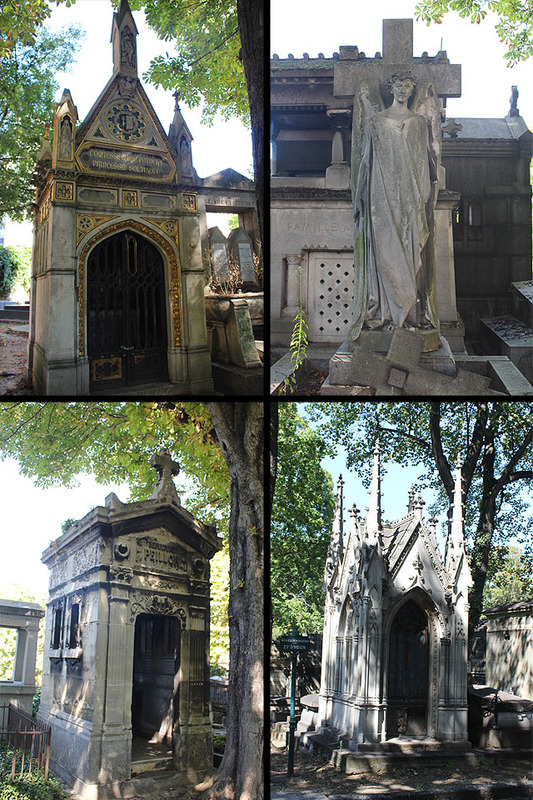 Like most Paris cemeteries, it's all above ground crypts - which makes for great scenery. Unlike New Orleans' cemeteries though, the Paris crypts are mostly little cathedrals where family members can come and pray. There is amazing artistry that goes into these (stained-glass, gargoyles, busts), and some of them had to cost a fortune, but I'm glad they paid because the Paris cemeteries are some of the most magnificent in the world. Beyond just walking through the rows and rows of crypts, we came equipped with our computers and did some work. 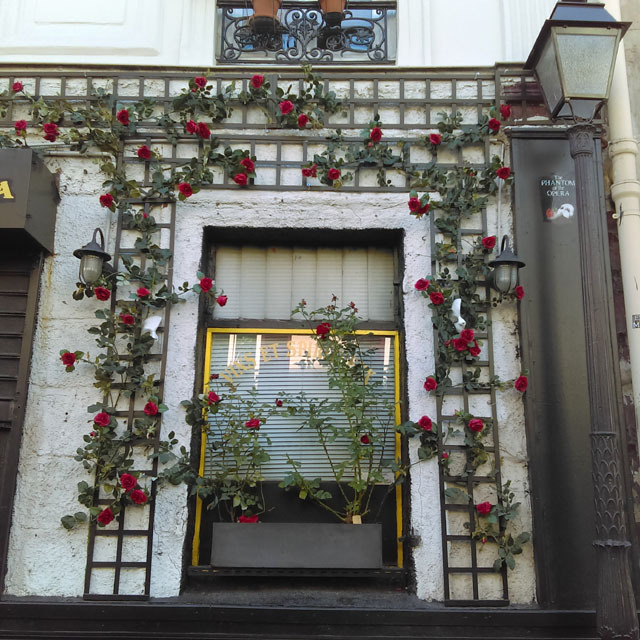 It was actually a very peaceful place in the busy Montmartre neighborhood to find a quite bench and do some work (and since Jim Morrison isn't buried there, there are a lot fewer tourists walking around). 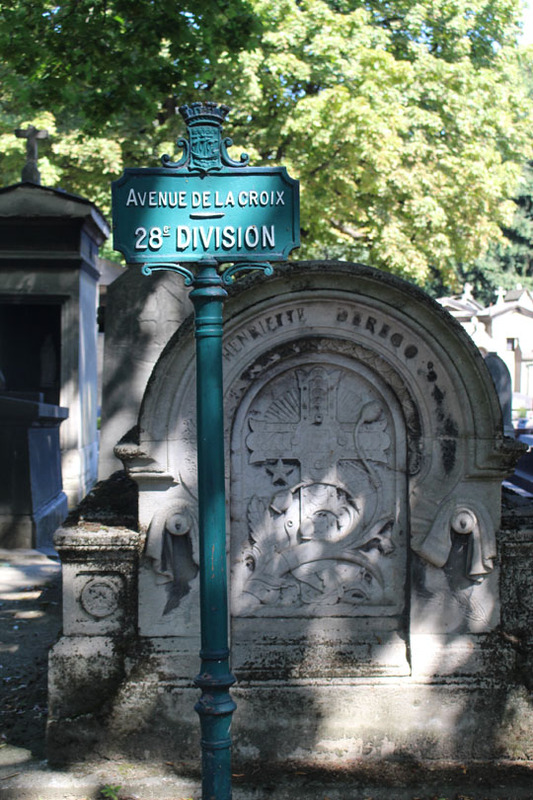 Paris loves their neighborhood numbers, so even the cemetery is broken up into arrondissements. Weeping women is a common motif for graves. 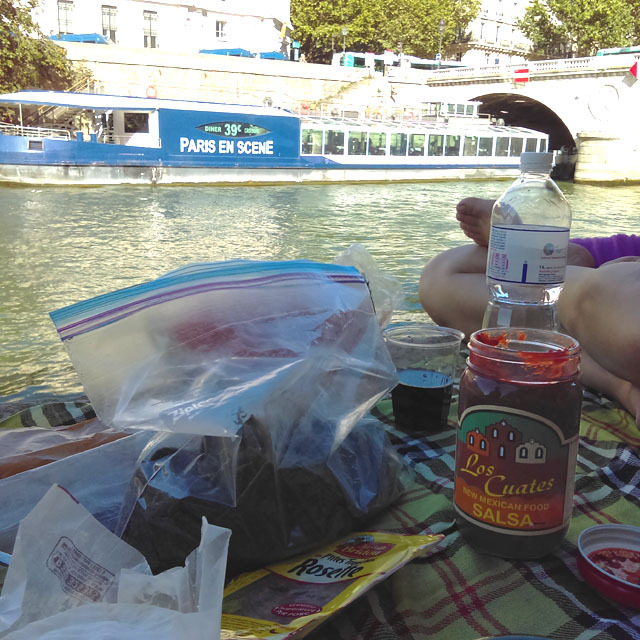 Besides Montmartre, we also kept going to our regular places on the river. 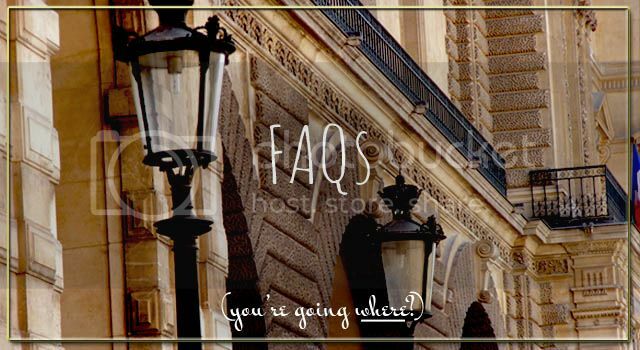 We even stopped a few times at the Louvre for a dinner on their amazing stretches of grass. It was starting to turn into Autumn while we were there, which created many great photo ops. A shot from the other side of the river of the place we ate dinner at the most, right at that point in the center. 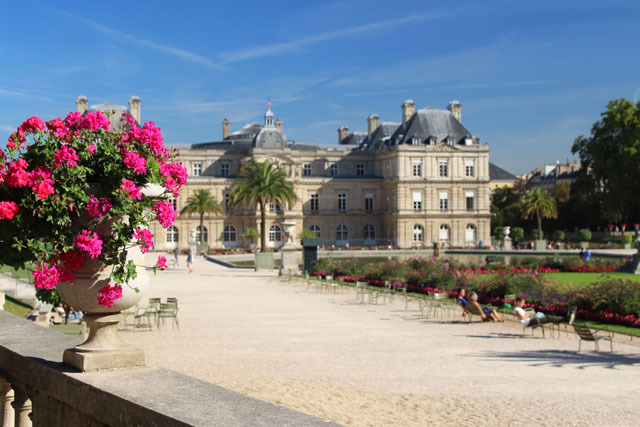 With Luxembourg Gardens so close, it was hard not to be drawn there for the occasional lunch. 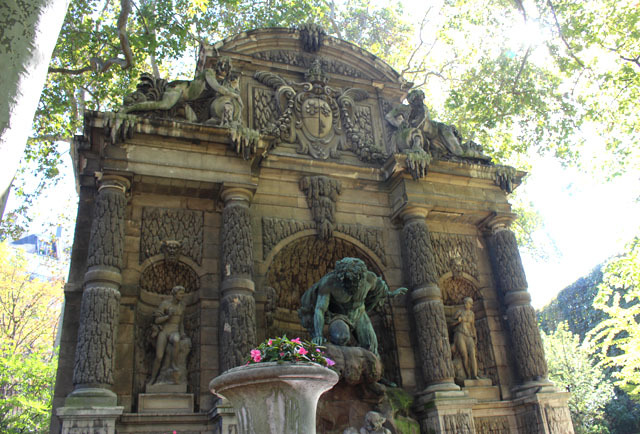 Our favorite fountain at Luxembourg Park. 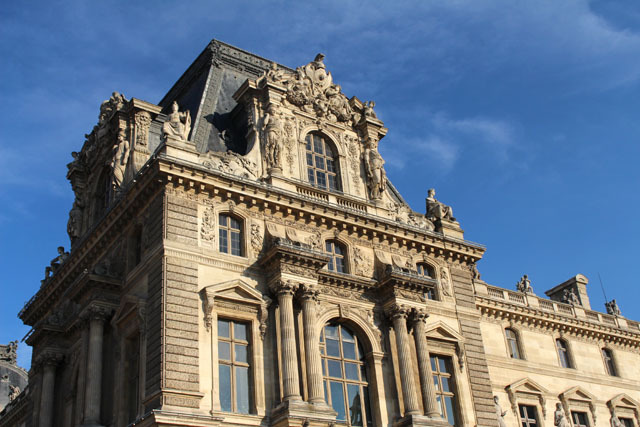 The stuff inside the Louvre gets all the attention, but the outside is just as amazing. Towards the end of our stay, some friends of ours came to stay with us for a week... and they bore gifts of the most glorious kind: Andrew's favorite salsa from Albuquerque, Los Cuates. 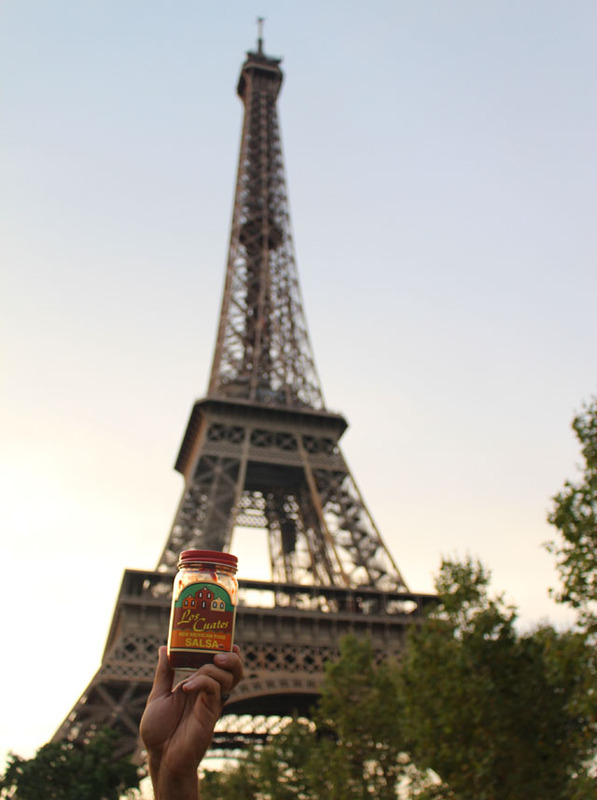 So we had to have some photo ops with it in some of the iconic parts of Paris. Los Cuates on the Seine. 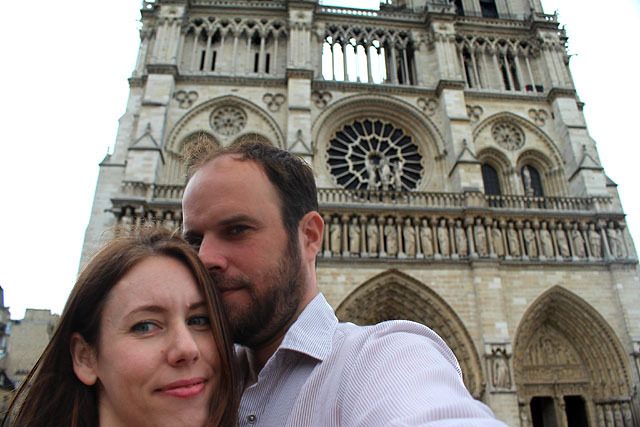 Our friends being in town also gave us a great opportunity to do something we hadn't done yet: be touristy. 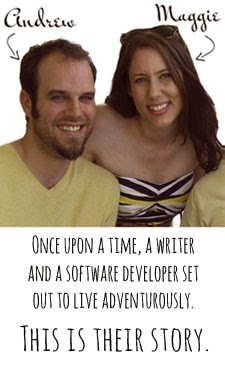 It's not that we're opposed to it, it's just not what we do when we're in a city for a longer period of time. So when they arrived, we put on our Hawaiian shirts (metaphorically) and headed to the sights. 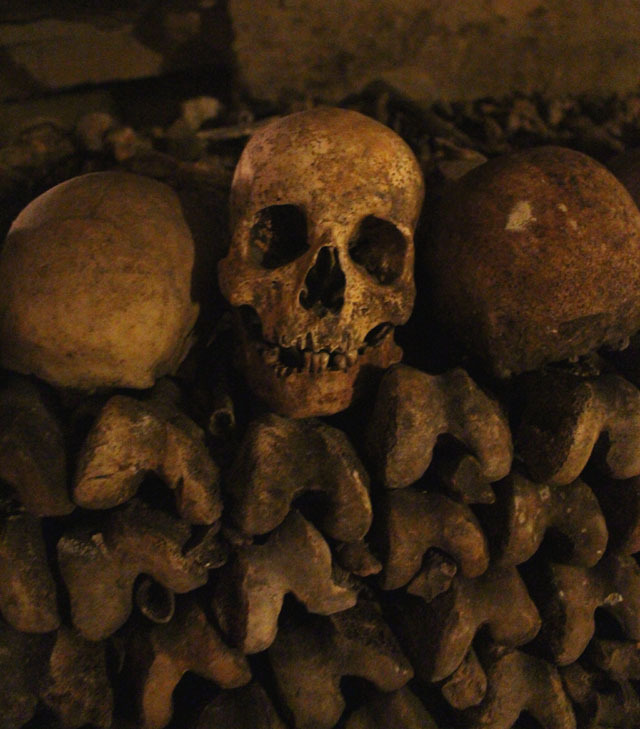 Something we had never done and really wanted to was the Catacombs. We tried to visit one other time, but we got there too late and the line was too long. This time we headed out early and still were in a huge line. They only let 45 people in at once, so the line goes slowwww. We stood there for around two hours before getting in, but once we were in, it was worth it. 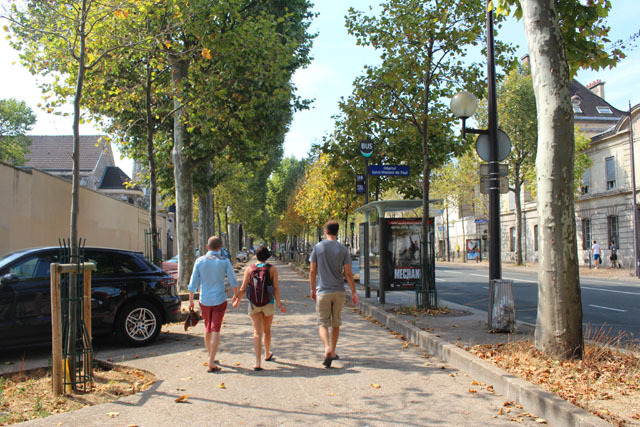 They say some 6 million Parisians are down there and we could believe it. The well-stacked bones you see in the pictures are just the retaining walls for the mounds and mounds of broken bones behind them. 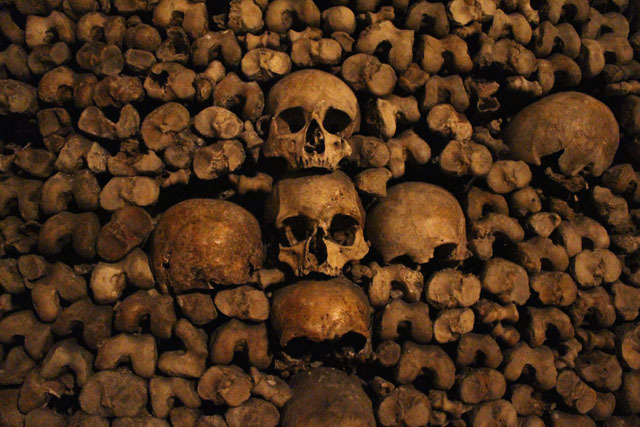 All the skulls, and the fact that you are 600 meters below the surface, makes the whole experience very creepy. On the way to the Catacombs. 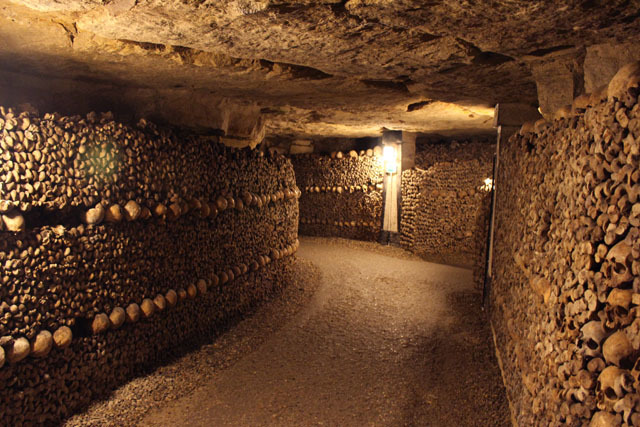 A normal hallway in the Catacombs. Femurs and skulls seemed to be the easiest to stack, and they made designs of them. 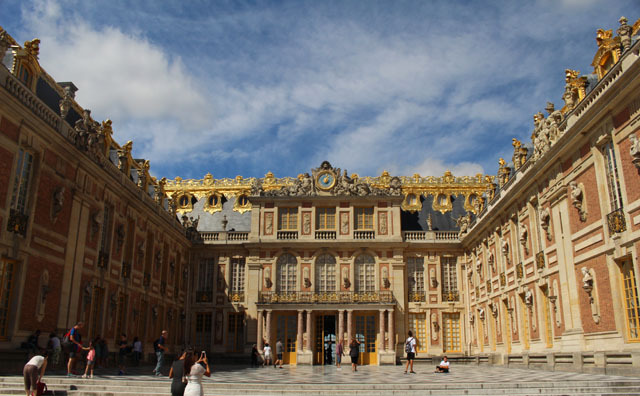 While Andrew had been to Versailles, Maggie had not, so we took the train out to the city of Versailles and spent a day walking around one of the most opulent palaces in the world. 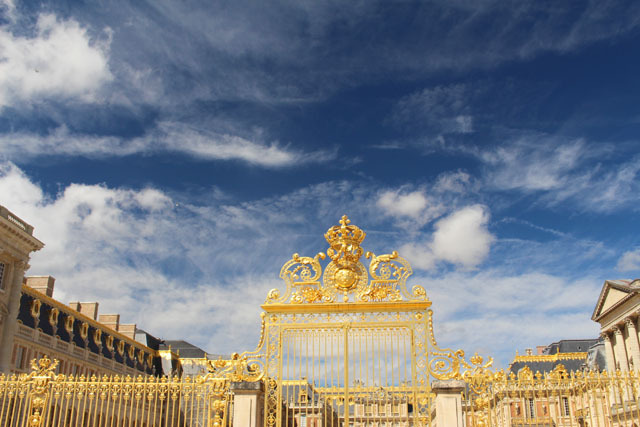 The gates were torn down during the French Revolution to symbolize the end of the 'us and them.' But then they decided they didn't really like "them" after all, and they needed the gates back. 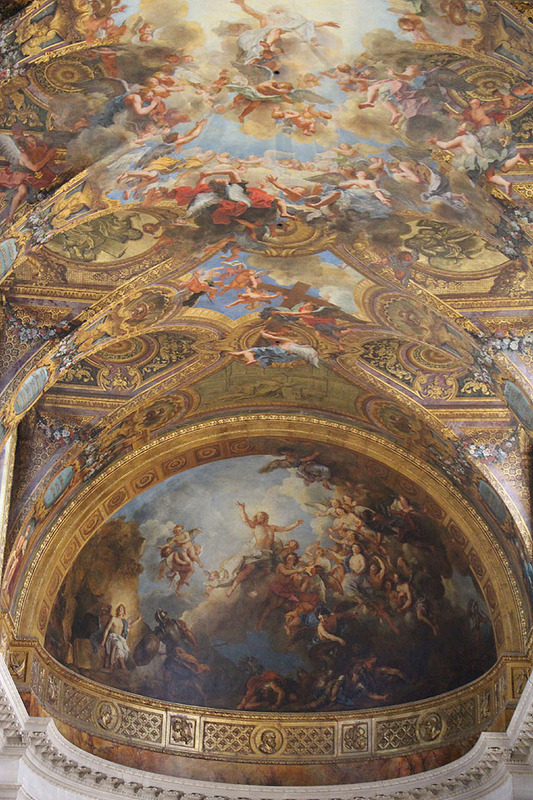 The ceiling of the cathedral inside the Palace is as amazing as the Sistine Chapel. 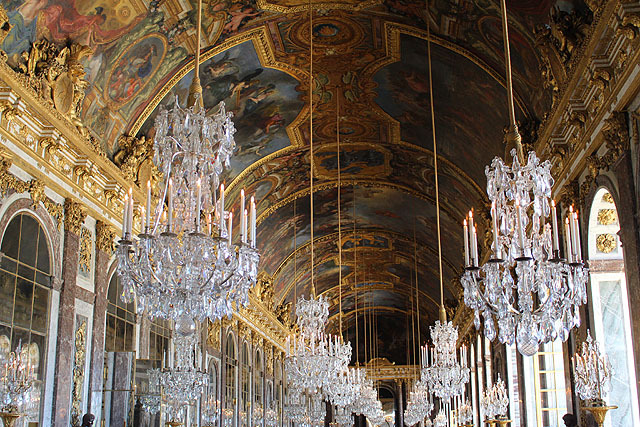 Maggie got many good DIY ideas at the Versailles. 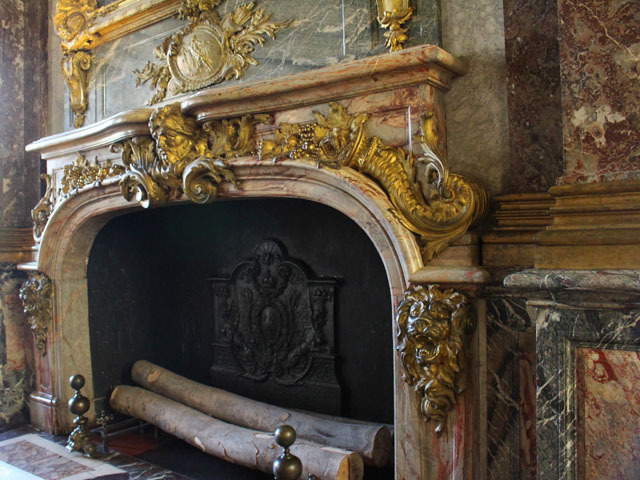 She now wants to do this to our fireplace. 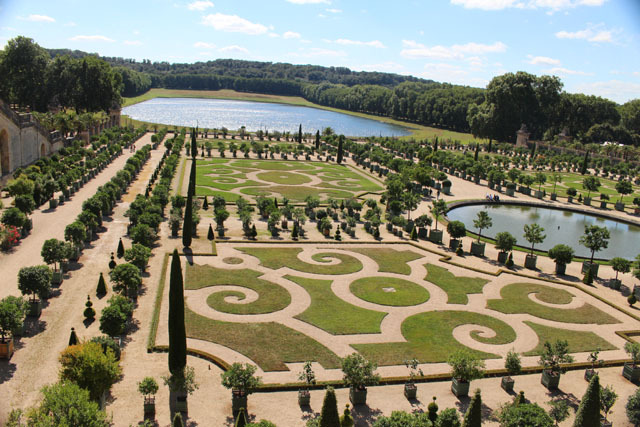 One of Versailles' many garden areas. 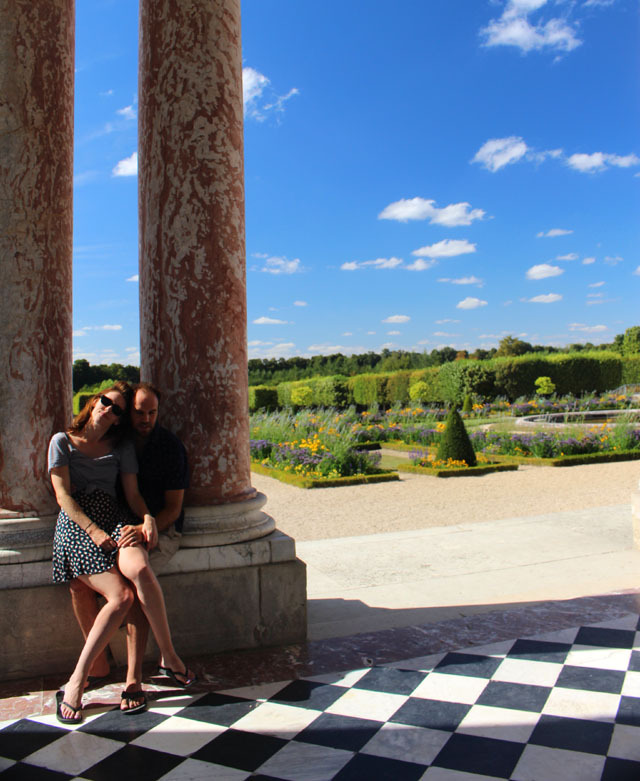 Maggie and Andrew hanging at Marie Antoinette's old stomping grounds. 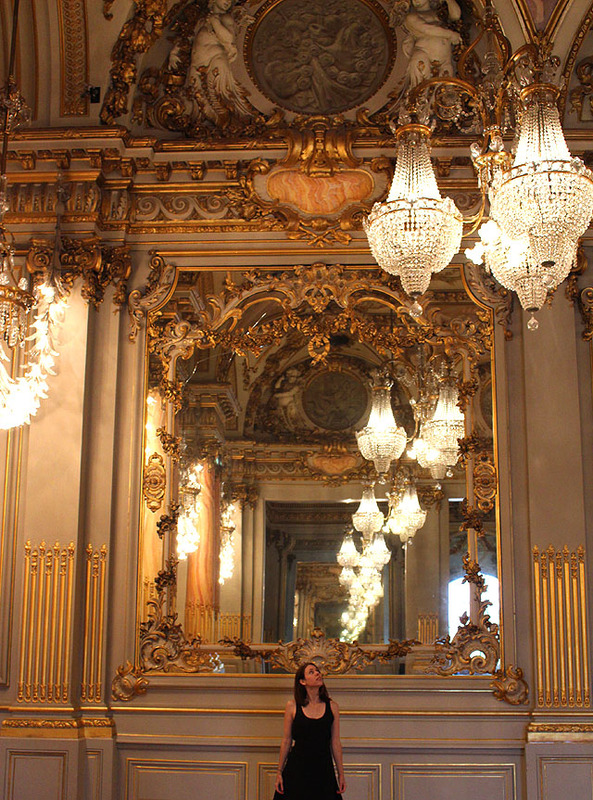 Never ones to pass up an opportunity to go to the Musée d'Orsay, we went one last time. Maggie looking out the clock. Maggie contemplating some more DIY ideas. 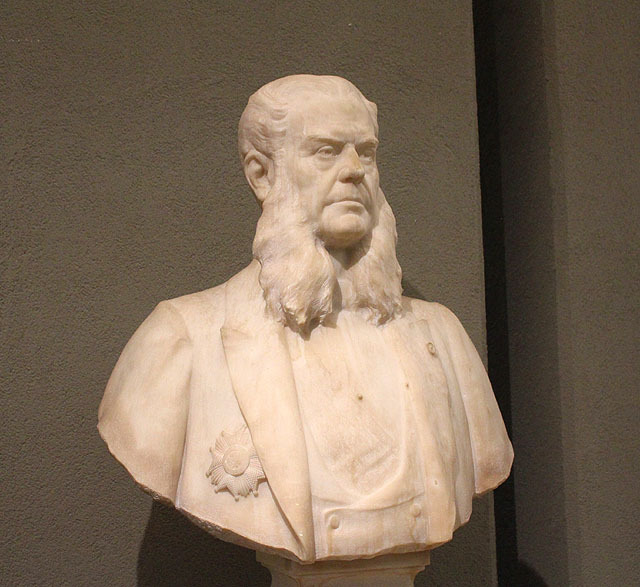 Andrew informed Maggie that these are the sideburns he wants when he gets old. Andrew's second favorite statue in the world, after David of course. 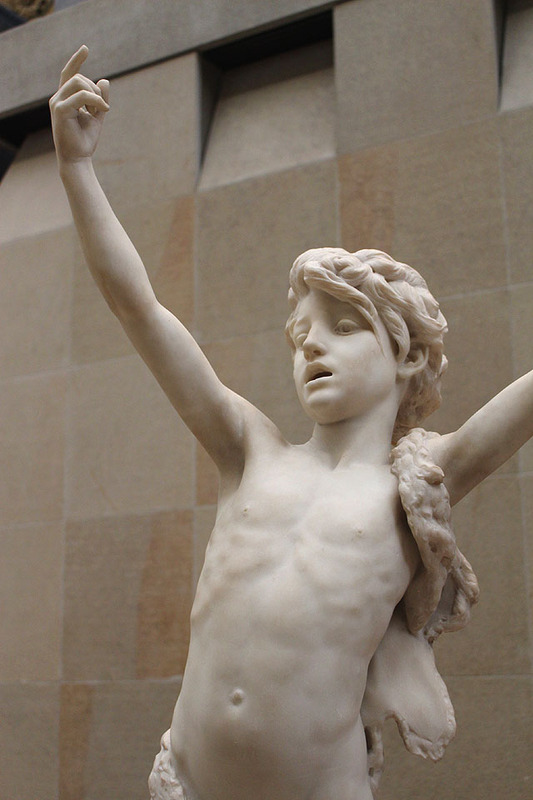 It's of a child Saint Jean-Baptiste by Paul Dubois, and feels like it should come to life at any moment. 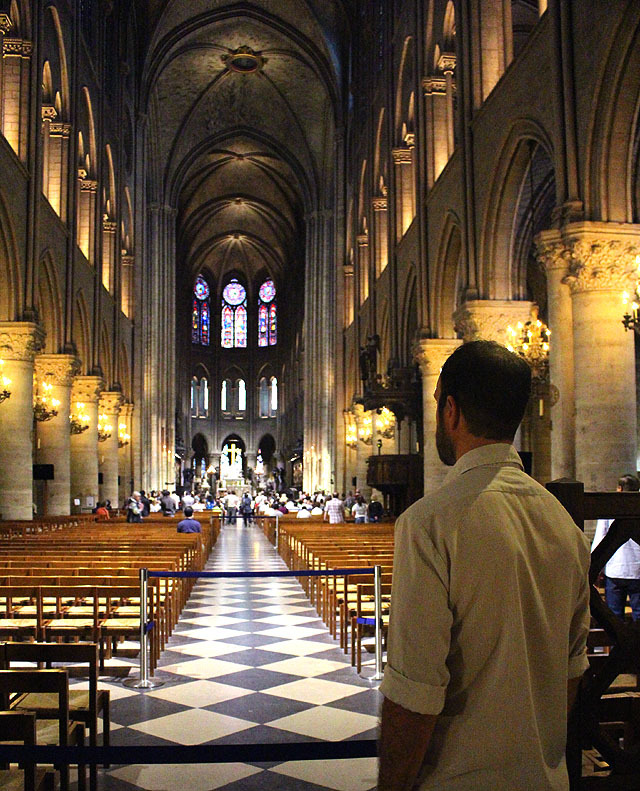 Something we had wanted to do for awhile was to go to a Mass at Notre Dame. Since we could literally hear Notre Dame's bells from our place, we knew this would be a dumb time to pass up that opportunity. Andrew was right. 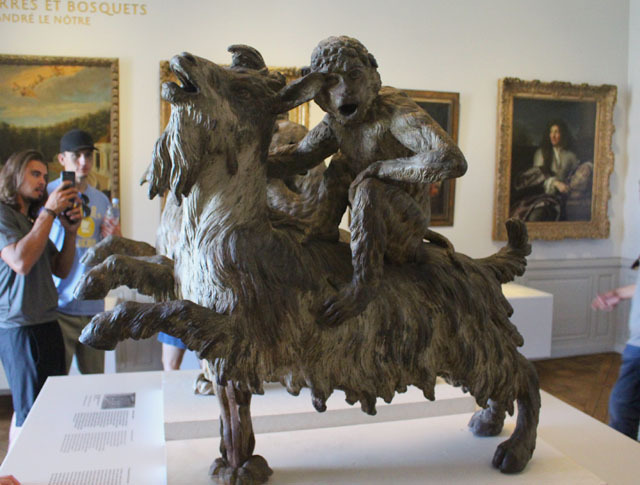 That statue of the monkey riding the goat was awesome. 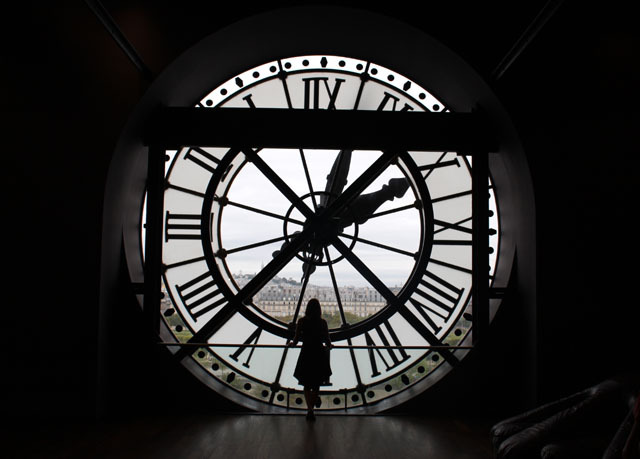 And that clock photo is quite amazing as well.